Experience the splendour of India's top architectural monuments, including several UNESCO World Heritage sites like the Taj Mahal , Red Fort and the stunning ruins of Fatehpur Sikri in Agra. 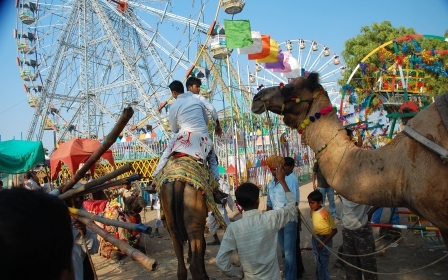 This 7-day Golden Triangle Tour with Ajmer and Pushkar give you an insight into the Muslim and Hindu culture along with Pushkar.During the tour you will Witness the Qutub Minar in Delhi and Akshardham Temple in New-Delhi, take an elephant ride to Amber Fort, visit the Hawa Mahal in Jaipur and admire the Lord Brahma's temple in Puhskar along with a visit to the tomb of the Sufi saint Khwaja Moinuddin Chisti in Ajmer. Your Golden Triangle with Ajmer and Pushker tour begins with your arrival at the New Delhi international airport, where you are greeted by our representative who will ensure that you get settled in your hotel comfortably. Your afternoon is at leisure and you can make a visit to the local market on your own . You spend the night at Hotel The Piccadily The to relax and be ready for the exciting sightseeing next morning. After breakfast, A full day tour of Delhi and New Delhi with your Tour Guide to visit highly popular places like Red Fort, Birla Mandir, Jama Masjid, Chandni Chowk, Qutab Minar, India Gate and many more. You spend the night at Hotel The Piccadily to relax and be ready for journey to Agra next day. After breakfast, you are driven by your personal chauffeur to Agra and en route you visit Itimad ud daulha, also known as the jewel box. Upon arrival at Agra, you are warmly greeted by our representative who will ensure that you get settled comfortably in your hotel. Later in the afternoon, after you have freshened up, guide will accompany you for a sightseeing tour of Agra covering the beautiful Taj Mahal and the majestic Agra Fort. After a long day in Agra, you spend the night at hotel Double Tree By Hilton to relax and be ready for the journey next day. After breakfast, you checkout from your hotel and are driven to Jaipur by your personal chauffeur and guide. En route you also visit the heritage site of Fatehpur Sikri, the abandoned sandstone city of the famous Mughal emperor Akbar. On reaching Jaipur, you are warmly greeted by our representative who will ensure that you get settled comfortably in your hotel. After a long journey, you spend the night at hotel Double Tree By Hilton to relax and be ready for the exciting sightseeing next day. After breakfast, be ready to visit the splendid buildings of Jaipur with your Tour Guide. First your commence with Amber Fort and ride on an elephant while enjoying the beautiful views of the city as well as Maota Lake. This fort was built by Maharaja Man Singh in 1592 and the construction continued in a row by others maharajas .It presents interesting site like Hall of public audience, sukh Niwas,Jas Mandir and Sheesh Mahal. After you step out to visit City Palace which is a paragon of Rajput architecture and leads to gateways, gardens and open courtyards.Later you explore Hawa Mahal also referred as the Palace of winds is a gem of Pink City. It was built purely for ladies so that they could watch the processions from the windows. Jantar Mantar, Albert Hall Museum and few Havelis are also eye catching structures and insist you to spend your time. You spend the night at Hotel Double Tree By Hilton to relax and be ready for your journey to Pushker & Ajmer next day. After breakfast, an excursion to Ajmer & then to Pushkar. Here you will visit the Dargah Sharif-tomb of the Sufi saint Khwaja Moinuddin Chisti and Adhai-din-ka-Jhonpra mosque in Ajmer.The mosque was built by Qutubuddin Aibak and completed by Iltutimish in 12th Century.Just next to it, visit Ana Sagar, an artificial lake which is an ideal spot for picnic and spend some quality time. On reaching Pushkar, Visit the famous 14th century Brahma Temple and Pushkar Lake and visit popular ghats like Brahma Ghat which is considered to be the oldest one. Later spend some quality time at Kishangarh Ghat to see the sunset and capture few photos. Rest of your day is at leisure and you can plan it the way you want to.A pleasure trip of Ajmer and pushkar surely rejuvenates your energy and would be greatly appreciated. Overnight at Hotel Double Tree By Hilton. After leisurely breakfast at the hotel, you will be met by our representative and assisted with check out formalities. You will then start your drive to Delhi International Airport in time for your flight home. If somehow you are not able to find the package that you are looking for, then write to us "[email protected]" or call us at +919758823555 and we shall be happy to Customise your tour for you. Excellent AC Vehicle through out the tour. 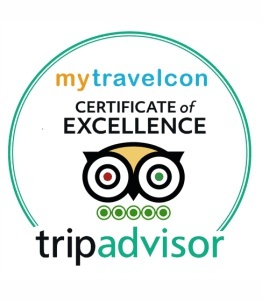 MyTravelCon is a humble initiative by Mr. Hemender Singh who himself has been a passionate Traveler, Tour Guide, Tour Consultant and much more at some point in his life with hands-on experience of tourism business for over 15 Years. Born and brought up in the Wonderful City of Agra – famously known for 'Taj Mahal' - a symbol of Love & Epitome, Hemen loves to serve tourists with extreme passion and high spirit of excellent customer experience.